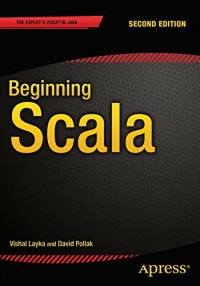 Beginning Scala, Second Edition takes a down-to-earth approach to teaching Scala that leads you through simple examples that can be combined to build complex, scalable systems and applications. This book introduces you to the Scala programming language, its object-oriented and functional programming characteristics, and then guides you through Scala constructs and libraries that allow you to assemble small components into high-performance, scalable systems. You will learn why Scala is judiciously used for critical business applications by leading companies such as Twitter, LinkedIn, Foursquare, the Guardian, Morgan Stanley, Credit Suisse, UBS, and HSBC. Scala is a multi-paradigm programming language that combines both functional and object-oriented features. Moreover, this highly scalable language lends itself well to building cloud-based/deliverable Software as a Service (SaaS) online applications. This book is for all programming enthusiasts and for Java developers looking to reduce boilerplate code, improve team performance, improve inter-team dynamics, and build more scalable and robust systems. Also, this book will appeal to Java developers looking to do cloud-based development. Lastly, Ruby, Python, Groovy and other programmers looking for a higher performance and a more robust language will benefit. New discoveries about the genetic underpinnings of many kinds of human experience are now constantly being made. This book explores the impact of these discoveries on the ways in which the common mental disorders are best conceptualized and treated.